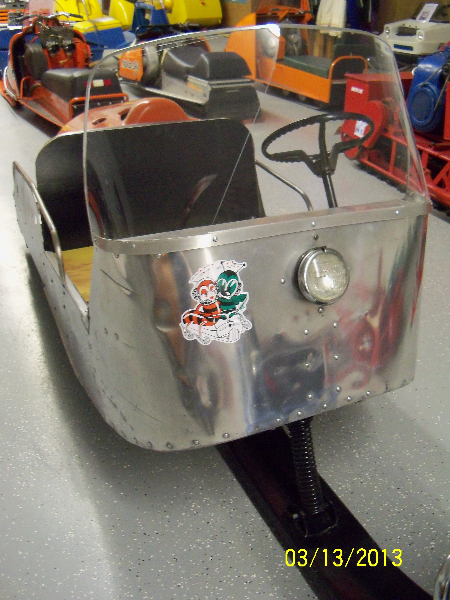 Schraeder’s invention, like any marketable product, needed a name and a picture to symbolize his snowmobile. Jimmy Grant, who worked at Noront Steel as a salesperson in the early 1960s, along with Rebellato and Schraeder, had a brainstorming session on a frigid winter day in Sudbury, and exchanged numerous ideas about what name should be given to Howard’s invention. The name Snowbee for example, Grant suggested, as well as Snowfly, and Bumblebee. “Howard the inventor”, as some friends often called him, rejected all those names until Bruno Rebellato came up with the name Snowbug. Somehow, this name sounded rather poetic or mystical to Schrader’s ears, and he approved the name. It is Rebellato who can be credited for calling this powerful snowmachine Snowbug, a snowmobile which could climb 45-degree slopes like maple syrup rolling off a French Pancake. Schraeder’s intense love for snow traveling was so all-consuming that he often spent his Christmas and Easter holidays in his shop working on his inventions. The very first Snowbug-snowmobile was fully developed and tested in Sudbury, Ontario, during the winter of 1957, one year before Armand Bombardier perfected his first Ski-Doo in 1958, Hetteen brothers from Minnesota built the first Polaris Sno Traveler in the winter of 1954-55. It can be fairly argued however that Schraeder’s experimental model pictured on page 4 was in fact a genuine snowmobile with an endless track and ski, features which define a snowmachine. This placed Schraeder at the forefront in the field of snowmobiles. During the first years, Snowbugs were hand-built. At the time, Schraeder was a hard working electrical maintenance employee at Inco, while Rebellato, who still resides in Sudbury, worked as a supervisor at Noront Steel, a position he held from 1946 to 1964. This snowmobile was the result of years of tireless experimentation with various prototypes, such as the one Schraeder apparently built using two McCullough chain saw motors in the early 1950s. This flat bottomed prototype Snowbug was powered by a five-pound, 6 hp air-cooled West Bend motor. The snowmobile weighed over 100 pounds and could be dismantled within a few minutes as it was made from three main parts: the track, the cab and the ski section.